Title page of Master Lee Han Chul's 1973 book entitled "Hyeol Beop Mu Sool" (Pressure Point Martial Skill) listing him as an 8th Dan Chong Kwan Jang Nim (Chief Master) of the Daehan Kido Hae Kuk Sool Won, and Chong Jae (Director) of the Korea Buddhist Martial Arts Research Institute. 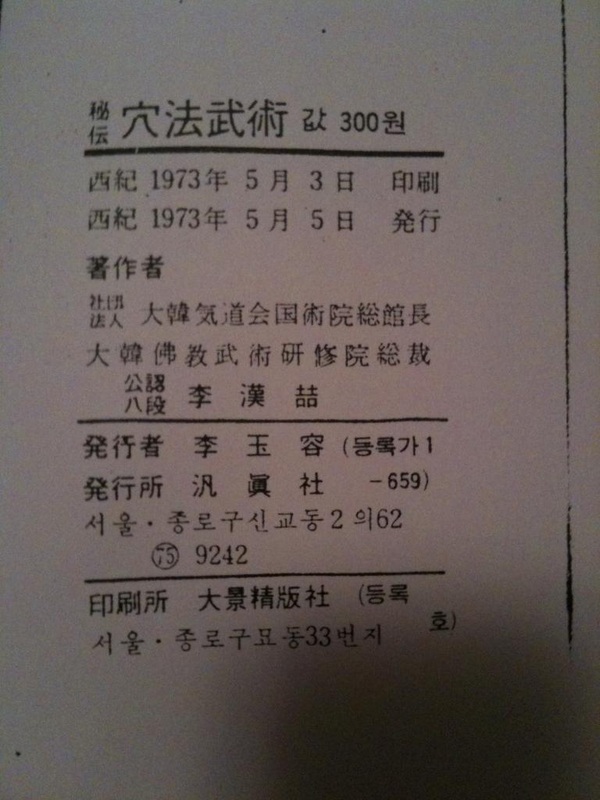 Master Lee Han Chul's 1973 promotion to 9th Dan by President Seo Kyung Bo (Venerable Dr. Il Bung) of the Korea Buddhist Martial Arts Association (and it's member "the International Kong Shin-Do Federation"). 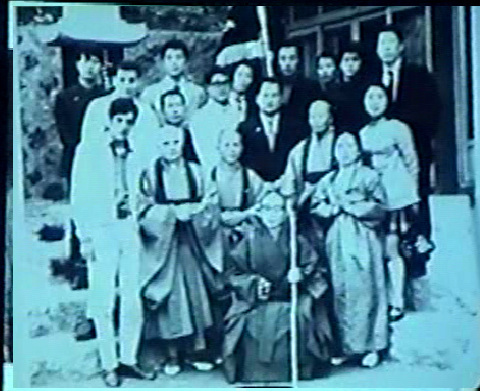 An image take after the founding of the Association in 1968 at Jogyesa Temple in Seoul, South Korea. Ven. Dr. Il Bung Seo Kyung Bo is seated, and CKJN Lee Han Chul is standing behind him, with the association flag in the background. A rendition of the original flag of the Association (hae ki), flown at it's founding at Jogyesa temple in 1986. The dragons (naga) are representations of mythological 'protectors of the dharma', they guard the emblem of the association which is a rose of sharon (the national flower of Korea- moogunghwa) encapsulating a first, grasping a staff and guarded by two swords. Sword, stick and body represent the totality and unity of the scope of our somatic dharma practice. The Chinese characters (hanja) or 'scholar's script" for the name of the Association grace the bottom of the banner (大韓佛教武術聯合會) representing the intellectual endeavors amidst the somatic pursuits of the temple arts we practice.